Osenbeiyasan Honpo Sen'yu "Kurokosho Sen"
A friend of mine gave me a bag of senbei (せんべい, 煎餅), rice cracker. It's called "Kurokosho Sen" that is black pepper rice cracker manufactured by Arai Seika under Osenbeiyasan Honpo brand. * Sen is an abbreviation of senbei. On the left side, it says, "Thank you for purchasing Kurokosho Sen. We only sell products online or at our directly managed stores to serve you freshly made senbei." On the left top, there's a note that this snack won "honorary president award" at a snack expo held in 2008. It's a no-filtered/sorted bag so that there're some broken pieces. 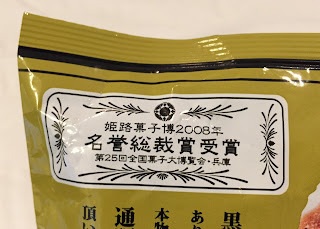 It had peppery scent and fragrant soy sauce scent when I opened the bag. There're of course whole, uncracked senbei in the bag. It's a thin senbei coated in no-sticky soy sauce with a hint of sweetness and roughly ground black pepper. 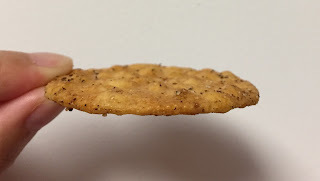 It's crispy and crunchy, and first I tasted soy sauce but immediately the heat of black pepper appeared and lasted for a long time in my mouth. 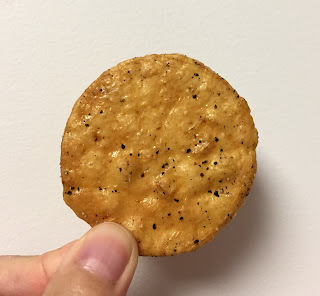 I love spicy food and this senbei was so addictive.